Philip Wemple was an adventurous man who lived in an adventurous era. He served in the army as an Indian Scout, stationed at Fort Alkali, a few miles east of where the town of Ogallala is today. It was his responsibility to ride along the tracks to protect gangs of workers and train passengers from Indian attacks. 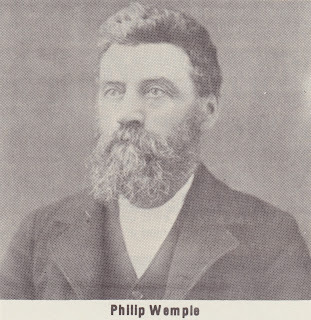 He spent some of his youth mining for gold in Colorado, and there is still a site called the Wemple mine in the Rocky Mountains northwest of Lafayette, Colorado. There is no information showing that he ever found any great amount of gold, yet it is quite possible, for it is known that at one time he owned most of the land where Parkersburg, Iowa, is now located. He sold off plots of it as people came in to settle and needed land to build homes on. Philip was a widower with one teenage daughter when he married Arvilla Carpenter. He was much older than Arvilla. His daughter was nearly as old as his new bride. 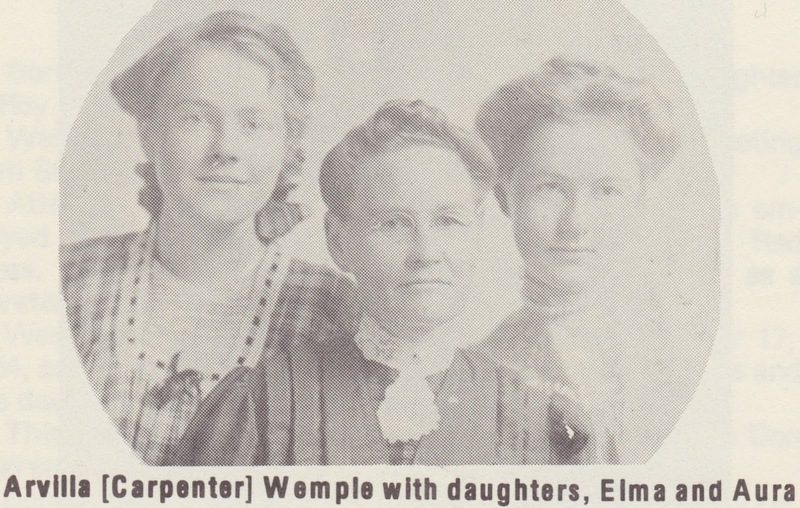 Philip and Arvilla had three daughters, Aural, Elma, and Emma. Aura was the mother of the writer of this biography. Philip was a large man, standing head and shoulders above many men of that day. He was kind to his family and doted on his daughters, but he ruled the household with a firm hand. His line can be traced back to 1620 when Jan Barentse Wemple was born. This Jan left his father, Barent Wemple, in 1642 to cross the Atlantic and settle at the Van Renssalaer Colony, 150 miles inland on the Hudson River on the east coast of America. Philip died while his three younger daughters were still in their teens. Arvilla, as his war widow, with her daughter, Emma, who was not yet 16, were eligible to claim free land under the Kinkaid Act. Mrs. Wemple and Emma came to Nebraska because others in their community were pulling up stakes and coming west. When she and her girls came, the Crouse family helped them a great deal. They had been neighbors and friends for many years back in Parkersburg, Iowa. Jesse Crouse and his son, Carl, built Arvilla’s soddy and hauled her belongings from the freight car to her earthen home on the Kinkaid. Many romances developed among the young folks of these early families. Carl Crouse wooed and won Aura, the oldest Wemple girl. 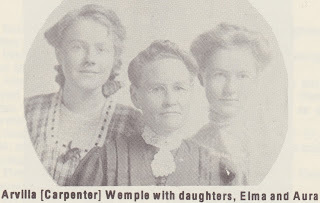 Elma, the next daughter married Paul Reichenberg, and Emma married Ed Parker, the son of another homesteader. Arvilla lived in Arthur County until her death in 1949. She is buried in the Arthur Cemetery. Her granddaughter, Bonnie Crouse Reichenberg, is the writer of this history. Thank you so much Carolyn! These stories are so amazing. I am so glad I have a platform to share them.